1. 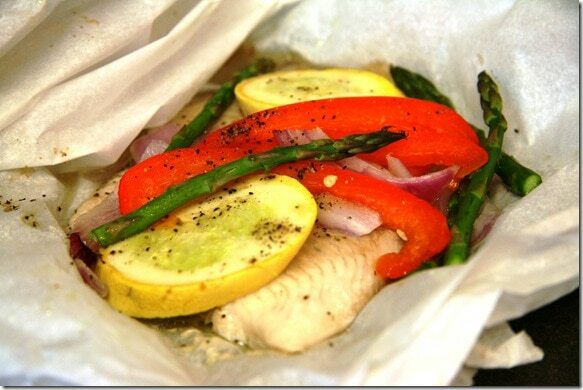 Place one tilapia fillet on a piece of parchment paper. Sprinkle with salt and pepper, top with chopped veggies, drizzle on some wine, and dot with butter or olive oil. A dash of garlic powder and/or other fresh or dried herbs would also be delicious! 2. Fold the parchment paper over the fish/veggies and seal by folding up the edges and twisting them shut — this will seal in the juices and steam the fish. 3. 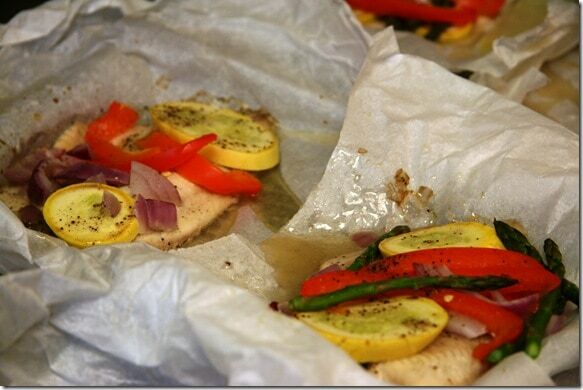 Put the fish on a baking tray and pop it in the oven for about 20 to 25 minutes, until the fish is flaky and fully cooked. Serve with a drizzle of fresh lemon juice.